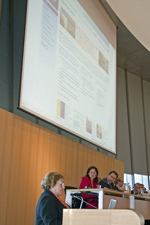 In 1998, the website of the Hague Conference was created in the Organisation's official languages, French and English. To meet the growing demand within the international community to access this information in other languages, a section called "Other languages" was created. This new section contains links to translations in several languages of the Hague Conventions and other documents relating to the HCCH. Spanish is the first language for which a separate site, modelled on the English and French versions, has been created. This was made possible by the substantial financial assistance from the Government of Spain and, above all, the impetus and indispensable contribution of Mrs Alegría Borrás, Professor at the University of Barcelona, expert and delegate of Spain to the Conference for many years. The official launch by Mrs Borrás of the Spanish section of the multilingual site took place on 31 March 2009, during the Council on General Affairs of the Conference.